A black eye is most commonly a result of bruising due to an injury. It occurs when fluid collects in the tissues around the eyes and blood vessels under the skin’s surface become broken. A black eye is usually accompanied by swelling of the affected area. Black eye, or periorbital hematoma, is a collection of blood located in the tissues around the eye. Any trauma to the eye or surrounding area can cause damage to the blood vessels, causing them to leak and resulting in the formation of a bruise. The skin around the eye is generally thinner than on other parts of the body, so usually, it doesn’t take much to get bruised there. Also, the skin tissue around the eye is looser, which means fluid leaking from blood vessels accumulates easier there. A black eye is also referred to as a “shiner.” The term is believed to have been coined back in 1904 because the appearance of a black eye seemed to have a shine to it. Alternative explanation suggests it’s called a shiner because it appears as if a person applied black shoe shine around the eye. A black eye is commonly caused by trauma to the eye. If something strikes the eye, it can result in damaged blood vessels. Accidents that can lead to a black eye include contact sports, falling, bumping into something, or being directly hit in the eye. Even medical procedures can result in black eyes, including cosmetic eye surgery, sinus surgery, or dental work. Serious causes of black eyes include cellulitis (a serious infection around the eye) and skull fracture. 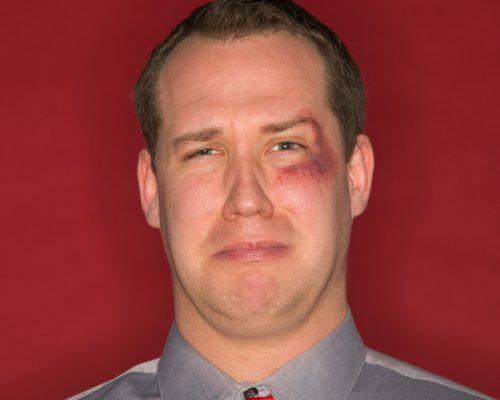 The most obvious sign of a black eye is a visible bruise and discoloration. A black eye can also be accompanied by swelling, pain, and blurred vision. More severe symptoms include double vision, vision loss, blood in the eyeball or on the eye surface, inability to move the eye, severe or an ongoing headache, fainting or loss of consciousness, and blood or fluid coming from the nose or eyes. Majority of the times, a black eye is a minor condition that will heal on its own. If the black eye was caused by a severe trauma, complications may arise. Complications resulting from a black eye include traumatic uveitis and iritis, hyphema (accumulation of blood in the front of the eye, can damage the interior tissues of the eye), glaucoma, retinal detachment, and orbital floor fracture, in which the eyeball is pushed deep into the socket, fracturing the bones that make up the eye socket. Unless accompanied by serious symptoms the best you can do for your black eye is allow it to heal on its own. Feel free to apply something cold to the eye to help reduce swelling and stop bleeding below the skin surface. You will also want to ensure you protect yourself from further injury to the eye to avoid the risk of complications. You can take pain relievers if pain is present. It’s always a good idea to visit your eye doctor after experiencing trauma to the eye just to ensure there is no deeper damage involved. Your doctor will instruct you if further treatment is required. Pineapple: Place a slice of pineapple on the affected eye and keep it there for at least 10 minutes. It is also believed that consuming pineapple juice may offer benefits. This should be completed three to four times a day. This works because pineapples are rich in vitamins which can help promote healing. Ice packs: If you are hit around the eye, to lessen the effects of a black eye immediately, apply cold to the area. Always ensure the eye pack isn’t going directly on the skin and not left on for too long or else this could lead to more damage. Applying for 20 minutes a few times a day can help reduce the effects of a black eye. Warm compressed: The first day of the injury should be treated with cold but the days following should be treated with warmth. A warm compress can help promote healing by reducing swelling along with increasing blood circulation to the area which can promote recirculation of pooled blood. Witch hazel: Soak a cotton pad in witch hazel and apply it to the affected eye for a few minutes. You can also mix witch hazel with chamomile and place it on the eye. Oil: Natural oils like olive oil, castor oil, and coconut oil may alleviate bruising. Ensure you apply it gently. Potato: Potatoes can aid in reducing swelling and pain. You can slice potatoes, refrigerate them, and apply a slice to the affected eye for a soothing sensation. You can also grate a potato and squeeze out the liquid and apply the ‘juice’ to your eye. Comfrey root: Create a paste by grinding comfrey roots with some water and apply to the affected area. You can also boil comfrey root to make a tea, soak a cloth in the tea, and apply it to the eye. By integrating these home remedies into your black eye treatment regimen, you may find that your black eye heals quicker.